No matter the time of year, your business relies on its heating and cooling system to keep your customers and employees comfortable. It’s especially critical when winter or summer temperatures are at their most extreme. That’s why it’s important to know when your air conditioner needs repairs. Catching the problem early can save your business from a more costly problem later on. Here are four common warning signs of a heating and air problem. Poor temperature control. Are your employees complaining about high humidity or uneven heating and cooling? Is it difficult to maintain a consistent temperature? Uneven heating and cooling may be caused by a problem with your thermostats or with the dampers in your ventilation system. Call an HVAC professional to investigate the uneven temperatures. Increased humidity. Air conditioning systems don’t only cool your building; they also dehumidify the air. If the air in your workspace feels uncomfortably humid, your air conditioner may be malfunctioning. Contact a repair technician to correct the problem. An increase in energy bills. As a business owner, you keep a close eye on your finances. Have your power bills started to skyrocket? Your heating and cooling system might be the culprit. If your air conditioner is malfunctioning, it will work less efficiently and run longer. Have your HVAC system inspected by a repair specialist. Unusual odors coming from the vents. Unpleasant smells coming from your air vents often indicate an HVAC issue. A moldy or musty smell usually points to leaks along the ventilation system that need sealing. A malfunctioning HVAC system can lead to poor indoor air quality, which can create a health hazard. Air quality problems frequently cause an increase in sick days and higher health care costs. 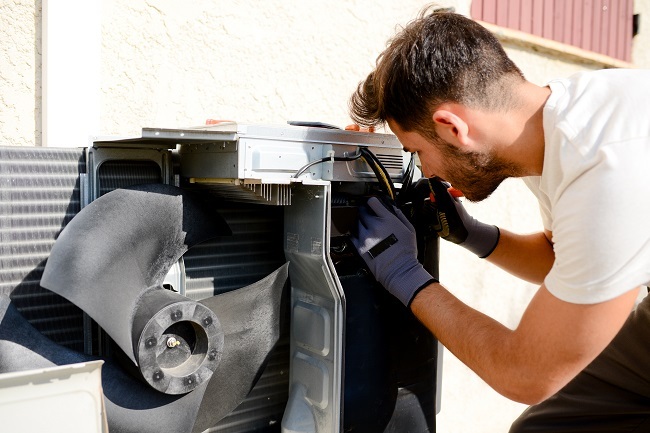 When your heating and cooling system needs attention, it’s important to act quickly. Small problems can become major breakdowns if they are not fixed right away. Contact us today to schedule your commercial A/C repair.